Desmond Richardson may be a household name for many of us, as he has had such an illustrious dance career and has enjoyed 20 years of success with Complexions Contemporary Ballet, which he co-founded. But did you know these facts about him? Desmond Richardson is from South Carolina. Desmond Richardson is one of four children in his family. Desmond is the youngest of four children. He has two brothers and a sister, and his brothers are also artistic. “Both my brothers went to a high school for art and design, one for illustration and one for cartoon animation,” he shared. “I’m the only one still pursuing the arts now though.” Desmond’s sister is in social work. We have PBS to thank for Desmond starting dance. If he wasn’t a professional dancer and choreographer, Desmond would be a…? “If I weren’t dancing, I’d probably be doing something physical because I love physical fitness and helping people, making sure they’re taking care of their minds and bodies. I’d probably be a personal trainer,” Desmond told us. The beef or the chicken? Is Desmond a morning or night person? 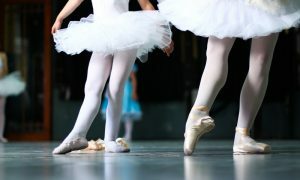 To find out what Desmond Richardson and Complexions Contemporary Ballet are up to this summer, visit www.complexionsdance.org. 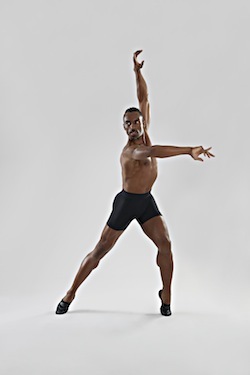 Photo (top): Desmond Richardson models for Capezio‘s “I Am Capezio” campaign. Photo courtesy of Capezio.